There is usually something new and interesting going on at The Oriole Mill. 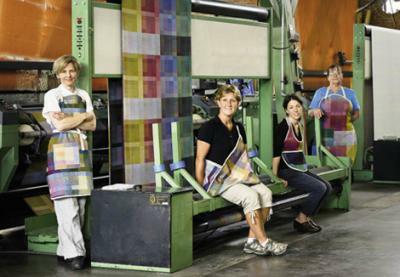 Find out what we’re up to and read what others have to say about us and our Hendersonville, North Carolina textile mill. 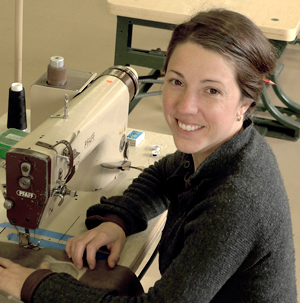 Asheville, NC – The Center for Craft, Creativity & Design (CCCD) is pleased to announce the sneak preview of the newest episode, Industry – Handmade in the Creative Economy, from the award winning series Craft in America. 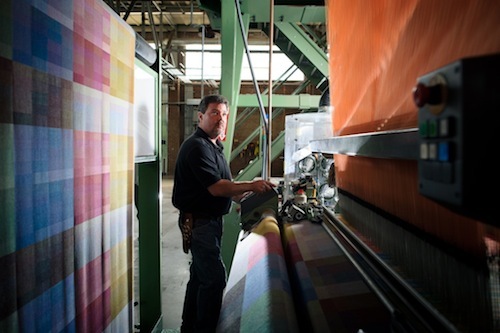 The screening will be followed by a discussion with the owners, artists, and technicians from local featured textile industry, The Oriole Mill. Craft in America: Industry explores the business of the handmade, taking us to workshops where artists are crafting the future and making contributions to the local and national economies. 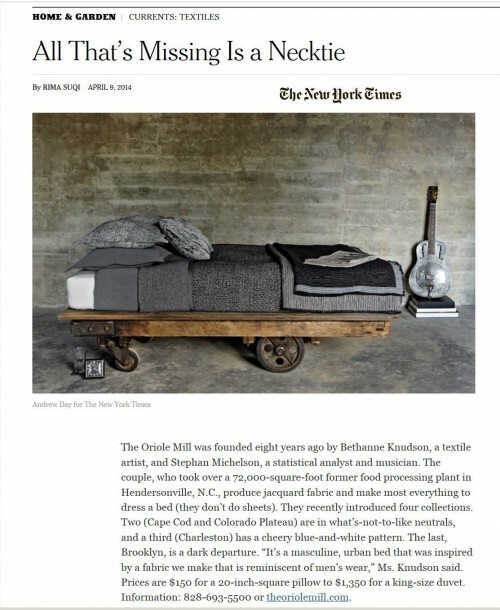 INDUSTRY highlights the important connection between the consumer and the maker and explores the value of exquisitely crafted handmade objects in today’s creative economy. Industry features San Francisco quilter Joe Cunningham visiting Lucy Mingo and Mary Ann Pettway in Gee’s Bend, Alabama, boat builder Graham McKay of Lowell’s Boat Shop in Amesbury, Massachusetts, Bethanne Knudson and Stephan Michelson of The Oriole Mill in Hendersonville, North Carolina, and Brooklyn, New York Etsy artist Shane Yamane. 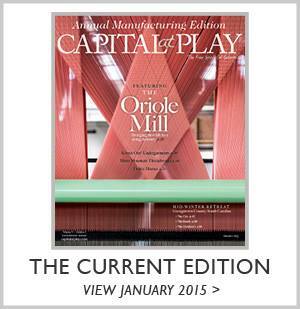 At The Oriole Mill in Hendersonville, North Carolina, American textile manufacturing is thriving once again. Deep in an area of the South, once the heart of textile manufacturing, Bethanne Knudson and Stephan Michelson are proving, through creativity, expertise and sheer determination, that an industry can revive itself. Knudson is one of the many Western North Carolina artists who have restarted the economy of Asheville through their creative endeavors and made it an arts destination. Tickets are $10, available at the Fine Arts Theatre box office or online at: goo.gl/jGxLkl. All proceeds will go to benefit the CCCD. The Center for Craft, Creativity & Design is a national 501(c)3 nonprofit that advances the understanding of craft by encouraging and supporting research, critical dialogue, and professional development. The Center’s programs strive to support the best examples of research and practice in the field. Craft in America is the Peabody Award winning series exploring America’s creative spirit through the language and traditions of the handmade object, presents INDUSTRY premiering on PBS primetime, May 2, 2014 at 10 PM (check local listings). Daughter Fish Podcast – Sew Co. Listen to this podcast about Sew Co.
Click here to listen to our Thread Cult Podcast! Click here to read the full Tight Knit Plan article.